Being a mom isn’t easy. There are good days and then there are bad days. And it’s completely normal to feel stressed out being a mom. I get it. I’ve been there and have had those days and moments many times. However, it’s how you deal with those days that actually matters. Chronic stress is very dangerous both for your physical and mental health. It can lead to headaches, depression, insomnia, and heart attacks. Once you reach a decline in your health, it is almost impossible to mommy full time and with all your strength. 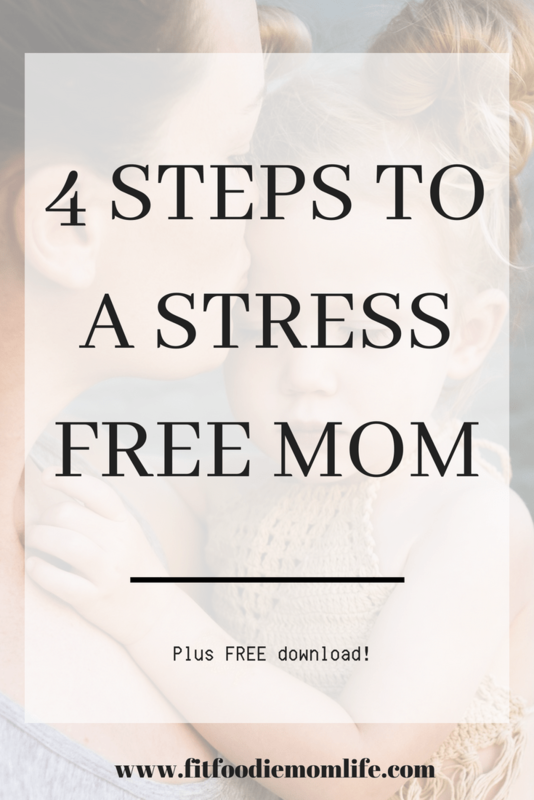 I’m going to walk you through 4 simple steps you can take to having more stress free moments. Because after all, it’s important to live in the moment and not let the stress and anxiety of everyday get to you. In a single day, moms have a ton to do. We change diapers, cook meals, feed the kids, clean the house, and so much more. Plus, if you’re a full-time working mom, you have yet another responsibility on your plate. Because of this, it’s crucial that you learn to set boundaries and say no once in a while. Unless you have enough time and energy to volunteer at the school bake sale or look after another mom’s child, you shouldn’t do it, and you shouldn’t feel guilty about it either. Mom guilt is real and it’s unhealthy. In fact, 99.9% of the time no one is judging you except for yourself. Exercise triggers the release of endorphins into the body, which helps to combat stressful feelings and leave you in a much calmer and relaxed state. Because of this, it’s important that you find time to exercise every single day. This might seem impossible if you’re particularly busy, but there are plenty of ways to incorporate fitness into your lifestyle. For example, you could work out at home while you’re little one is napping or playing. Check out my free download. You can access up to 20 free home workouts! Babies and children in general definitely take up a good portion of monthly finances. Once you add up diapers, wipes, clothes, shampoo, toys, you know, the necessities. Thus, money is a pretty big deal among mamas. Thankfully, there are plenty of things that you can do to save yourself some cash here and there. One of the most common is shopping around; Whether you’re looking for food, used auto loan rates, or baby clothes, you should always take the time to look for the best deal. You can also use online coupons, loyalty cards, and points cards to make your money go further. Plus, enrolling into a points reward system when it’s an option is always the best way to go. Check out Young Living. An online store full of health products, essential oils, home goods, cooking items and much more. Plus, the reward system is worth every investment. No one enjoys cleaning, but unless you clear away some of your clutter, it’s going to be incredibly difficult to relax. I’m super OCD so I have a very hard time going to bed with dishes piled up in the sink. Remember, your house doesn’t have to be sparkling clean, but it also shouldn’t be bursting at the seams with junk or filth either. Start in one room and go through everything you own, getting rid of the things you no longer want or need. Whatever you have left, you should put away tidily. Once you’ve done this in every room, you should feel a lot calmer at home. Believe it or not, mess causes a lot of inward stress and tension. It’s totally normal to feel stressed and/or overwhelmed. If you didn’t, I’d be worried or question my mom skills. But it’s more important how you deal with stress. Your children will feel your stress and tension and that’s not the image you want them to remember. Create a happy environment. You’re in control of that!